An analysis of the mineral inclusions in diamonds dredged up by eruptions from deep within the Earth has allowed scientists to get a handle on when the process of plate tectonics began. 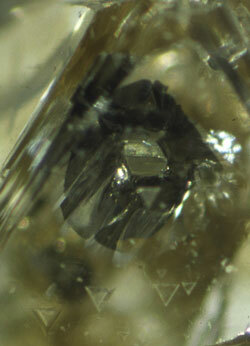 Trapped within the diamonds are tiny inclusions, the mineral clues as to how the Earth's continental crusts formed. Researchers in the US and South Africa have assembled the story of the Earth's early geological past from a dataset of 4287 silicate inclusions - analysed using the samarium-neodymium isotope system - and 112 sulfide inclusions - analysed using the rhenium-osmium isotope system. These inclusions were recorded in diamonds from five ancient continents and used to map out the history of Earth's crust. The analysis is based on about 20 studies1. These ancient diamonds originate from mantle depths of 125 to 175 kilometres and so radiometric dating of the minerals trapped within provides a snapshot of the processes occurring deep within the mantle at the time they were formed. Shirey and colleague Stephen Richardson of the University of Cape Town, South Africa, have used the data to reveal that mineral composition changed dramatically approximately 3 billion years ago. The older inclusions comprise only peridotitic minerals, mostly chrome-rich garnet and nickel-rich iron sulfide, which are residues of earlier mantle melting, they explain. Mantle melting has occurred throughout Earth's history. The younger inclusions contain predominantly eclogitic minerals. Eclogite is a metamorphic rock that is the high-pressure equivalent of the basalt that forms by partially melting the mantle peridotite. Basalt makes up the oceanic crust. There are two explanations for the presence of eclogite. First, it could be that basalt rocks from the base of the continental crust were converted into eclogite and carried downwards. Second, oceanic crust from the most ancient continents was dragged under, or subducted, by plate tectonics. Shirey and Richardson believe that the evidence points to this latter explanation. If proven correct, then these ancient diamonds mark the beginning of modern plate tectonics by which supercontinents were assembled and dispersed. The question remains as to what existed prior to plate tectonics. Some evidence from west Greenland and South Africa suggests that there was some type of subduction over 3 billion years. It now appears that this may have been a different form of subduction. Shirey and Richardson suggest that because there were no eclogitic inclusions in diamonds before 3 billion years ago, because deep plate subduction mechanism, by which that mineral could reach such depths, did not occur. Around 3 billion years ago, cooling of the mantle allowed much larger plates to form and this set in motion plate tectonic processes that disperse and reassemble continental masses. Martin Van Kranendonk of the Geological Survey of Western Australia says: 'Shirey and Richardson show that the [mantle] composition changed dramatically at about 3 billion years ago.' This suggests the onset of modern plate tectonics. 'The picture emerging from combined lithospheric studies is that our planet may have experienced a stepwise change in tectonic style at [around 3 billion years ago],' adds Van Kranendonk2.